So, I imagine that by now, after the Christmas baking post overload you’ve received from me, and also the likely over-consumption of all things turkey, cranberry and stuffing-related, your taste buds will be craving something just a little different. I know mine were and that spicy Mexican enchiladas were just what I had in mind. So here’s my recipe for them – nice and easy after all that holiday cooking. When travelling around California, I saw enchiladas on menus countless times (probably a sign that we frequented Tex Mex places a little too often in our 3 week holiday!). I had never before encountered an enchilada though and failed to do so throughout our trip. Why, I thought, would you want to ruin what is essentially a delicious fajita by smothering it in “red” sauce? Surely just a recipe for a soggy mess? The fact the red sauce was unidentified (tomato? pepper? anything hanging around in the fridge that happens to be red?) added to my general suspicion of the concept. But, as usual when I turn my nose up at something in a slightly Miss Piggy-esque manner, it turns out I was completely wrong. I was far too quick to judge something I quite clearly did not understand at all. It turns out that the “red” sauce is in fact a delightful concoction of tomato puree, garlic, herbs, chilli powder, and in my recipe, salsa. It also turns out that slathering a chicken, onion and pepper filled tortilla in said red sauce, topping it with a generous portion of grated cheese and baking it in the oven until the sauce is bubbling and cheese turning a golden brown is the best plan ever. Yes, my soggy fears were correct, but only slightly soggy and in such a good way. Give these a try and I assure you you’ll crying “Arriba Arriba Andale!” and asking for seconds! 1. First make the red sauce. Heat the oil in a small saucepan over a medium heat and add the garlic, herbs and spices. Cook for 1 minute before adding the passata and water. Bring to a gentle simmer and leave, uncovered, for 30 minutes until the sauce has reduced by about a third and thickened. 2. Preheat your oven to 200°c/180°c fan. 3. 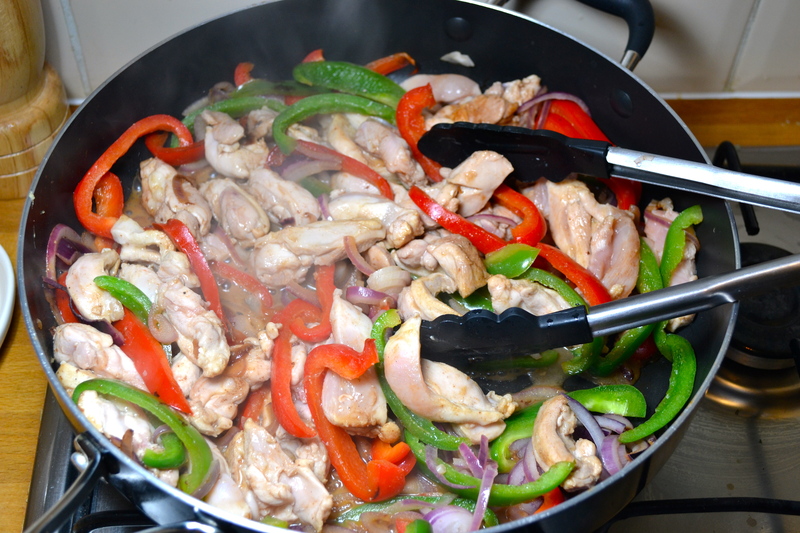 Meanwhile, heat the oil for the filling in a saute pan or medium saucepan. 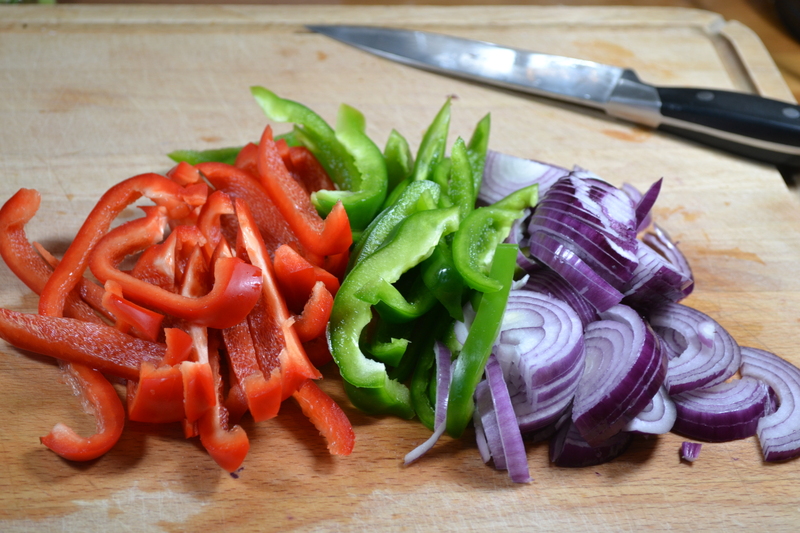 Add the ground coriander, followed by the peppers and onions. Cook for 5 minutes, stirring regularly, then add the chicken. Cook for a further 10 minutes or until there is no pink meat left in the chicken. 4. Take one tortilla and arrange 1/6th of the filling in the centre of it. 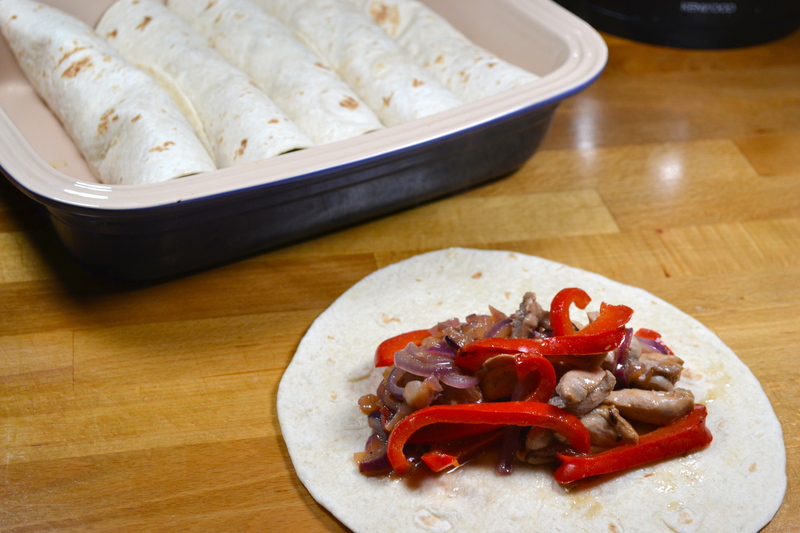 Roll up the tortilla and lay in a rectangular oven-proof dish that’s approximately 30cm x 20cm. Repeat with the rest of the tortillas. 5. 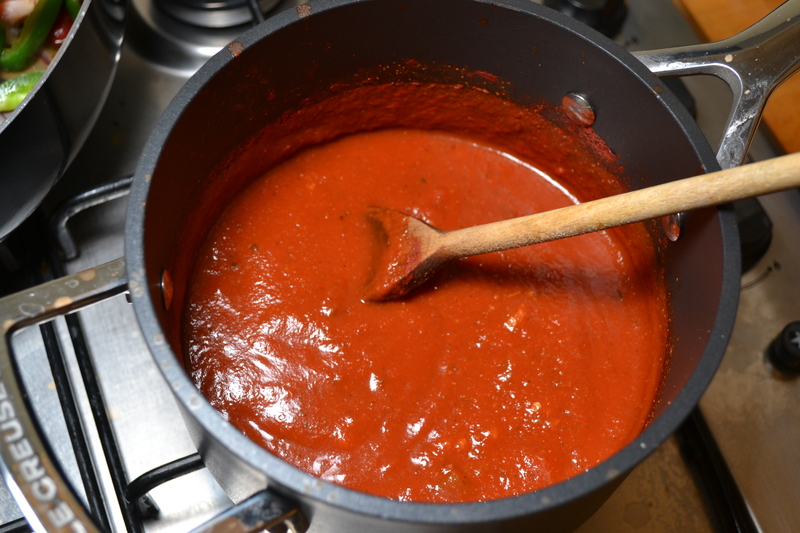 When your sauce is ready, stir in the salsa and allow to heat through for a couple of minutes. 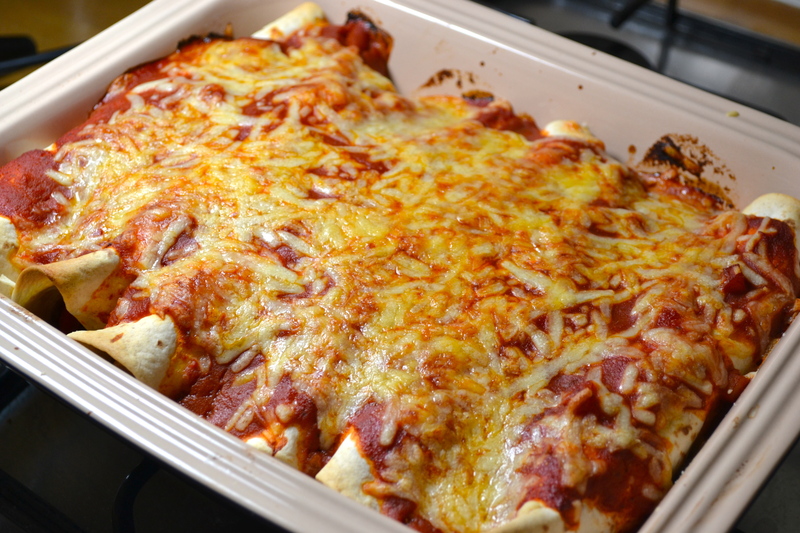 Then pour the sauce all over the enchiladas and scatter the cheese on top. 6. 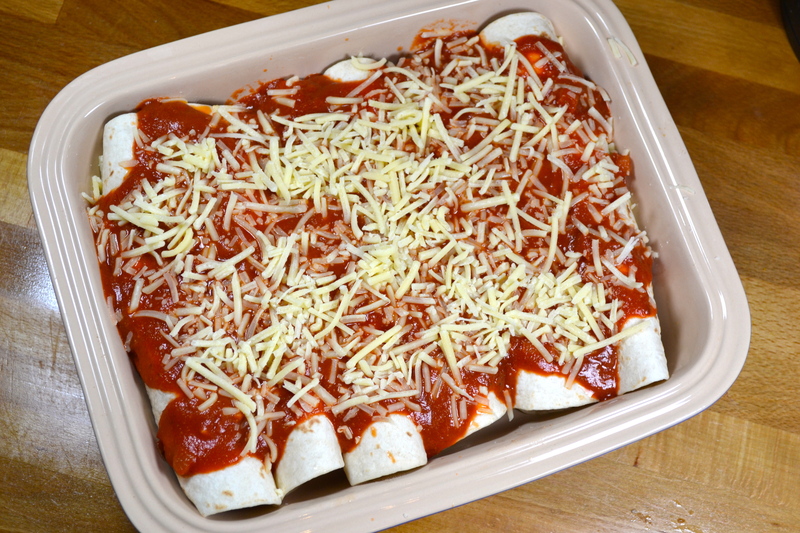 Bake in the oven for 15-20 minutes until the sauce is bubbling and the cheese turns golden brown. Eat immediately. PS If you have time, you could marinade your chicken in the lime juice for 30 minutes before cooking to add extra flavour.